This summer’s CSA (community supported agriculture) share in the bounty of Roxbury Farm has surpassed earlier years. And for the first time in the past five years, we have received Delicata squash, a cream-colored winter squash with green and orange stripes, from the farm in Kinderhook (Columbia County, NY) in our weekly shares on a couple of occasions. 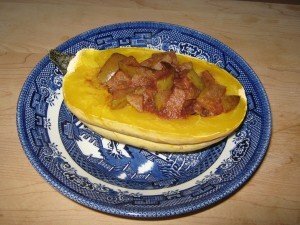 With the summer heat, baking the Delicata squash in a hot oven, my method of choice at Thanksgiving time for preparing acorn or butternut squash, was a no go. The unused, small microwave oven, which has peered down from underneath a kitchen cabinet for 30+ years, caught my eye. Hmmm. The Global Healing Center, which is an advocate for “organic living and natural health,” notes in an article, “Why You Should Never Microwave Your Food,” that “Microwaving cooks the food at very high temperatures in a very short amount of time [but results] in a great deal of nutrient loss for most foods, especially vegetables.” Still, the bigger concern in microwaving food relates to the fact, cited in this insightful article, that “microwavable foods are processed and in packaging that contains an assortment of chemicals (such as benzene, toluene, polyethylene terpthalate, xylene, and dioxins)” and these chemicals are “likely” to be absorbed into the food. Using the microwave to cook a Delicata squash quickly on a hot summer day will result in some nutrient loss, but at least the danger of absorbing chemicals from packaging is not an issue. After some pondering, the summer heat prompted me to make an exception to my practice of not microwaving food. 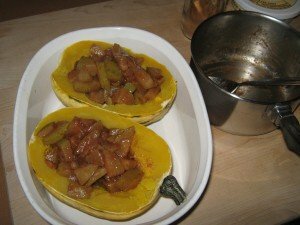 In 30 minutes, a Delicata squash was a surprising summer treat, with sautéed Bartlett pears picked locally at the historic Pear Orchard in John Boyd Thacher Park, a favorite hiking spot in the Helderberg Escarpment just west of Albany in upstate New York. 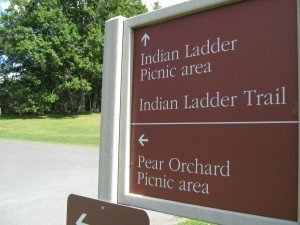 Some explanation is needed on harvesting some pears from a state park. 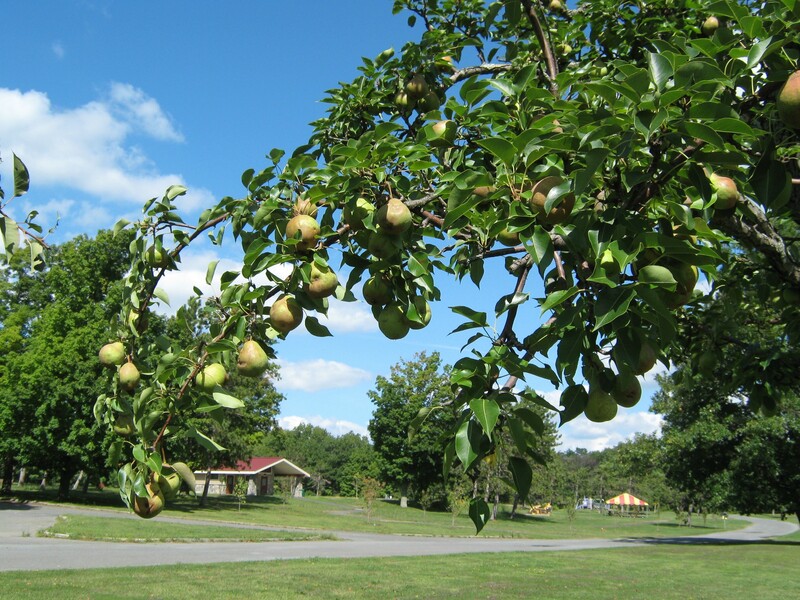 For years, the pears ripening in Thacher Park above Albany have caught my eye. On occasion, I’ve picked a couple to taste the local fruit growing freely in the mountain air. This year, the fruit was bountiful and appeared to be going to waste, with many falls, decaying beneath the trees. A short conversation with a supervisory park ranger gave me the o.k. 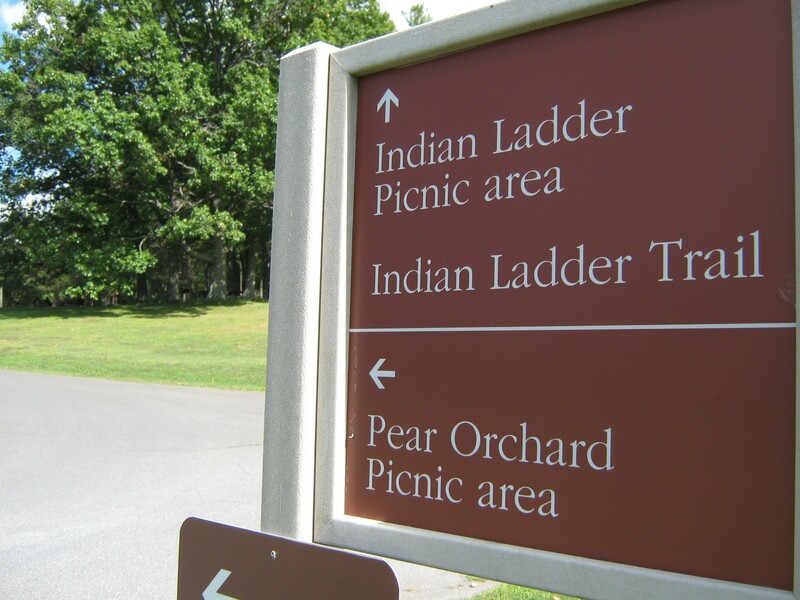 to pick some pears. These very local Bartlett pears (growing just up the road from my home in Albany) would make for a buttery and fruity topping for the delicious Delicata squash (also known as peanut squash, Bohemian squash, or sweet potato squash). According to the U.S. Department of Agriculture (USDA), 31% or 133 billion pounds of food in the United States goes uneaten. 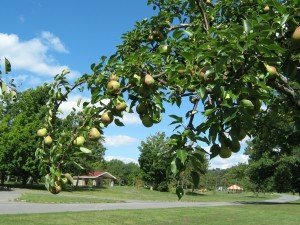 Using some overlooked pears in a state park seems trivial in contrast, but nonetheless brings special satisfaction in knowing fruit, which would have gone to waste, has made for a tasty dish. With good reason, Delicata squash is also known as sweet potato squash since the taste is very similar to that of a sweet potato. I’m not so sure why it is also known as a peanut squash, though its flavor is mild like peanuts. Slice the Delicata squash in half, starting at the bottom of the squash and slicing downward to the stem. Scoop out the seeds and any pulp. 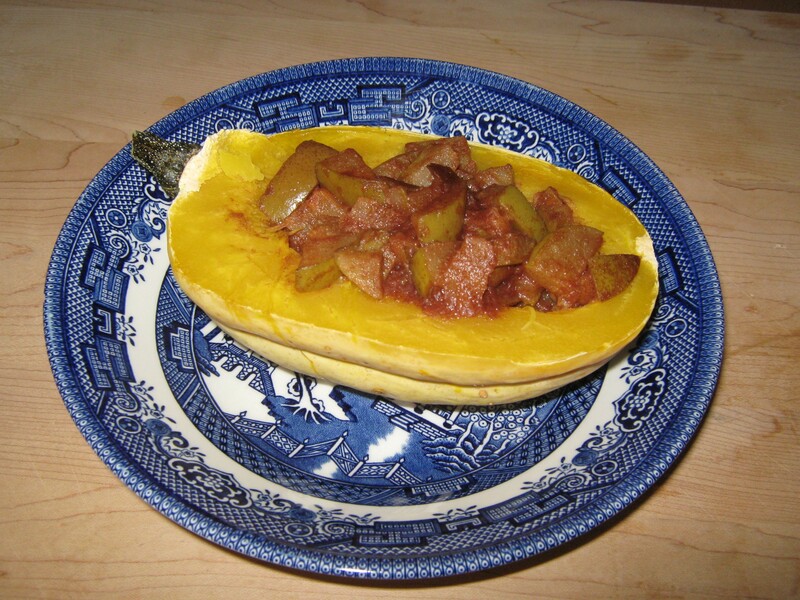 Place squash halves cut side down in a microwaveable dish. Add ¼ to ½ inch of boiling water to the dish. Microwave on high for 10 minutes. While the Delicata squash is cooking, slice up 4 small pears into small pieces. (I do not peel the pears since the skins will cook down nicely and add nutrition and flavor to the sautéed fruit.) Melt the butter in a small pot. (I like to use a local butter, Kriemhild Meadow butter from the Hamilton (Madison County, NY) dairy farm’s grass-fed cows.) Add the sliced pears and cinnamon, and stir continuously for a few minutes. Add 3/4 cup of boiling water, and continue to simmer the fruit until tender, an additional 20-25 minutes, stirring occasionally and adding more water if needed. 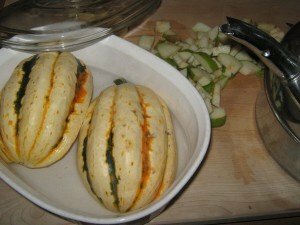 Remove the Delicata squash from the microwavable bowl after it has cooked for the 10 minutes indicated above, and drain the water from the bowl. Turn the squash, cut side up and fill with the pear mixture. Return the bowl to the microwave oven and cook on high for an additional 5 minutes. Enjoy delicious Delicata squash in the heat of late summer!